The American Psychological Association’s member magazine, the Monitor, recently highlighted 10 trends in 2018. One of those trends is that Applied Psychology is hot! In this special APA Monitor report, “10 Trends to Watch in Psychology,” we explore how several far-reaching developments in psychology are transforming the field and society at large. As technology changes the way we work, play, travel and think, applied psychologists who understand technology are more sought after than ever, says Anne McLaughlin, PhD, a professor of human factors and applied cognition in the department of psychology at North Carolina State University and past president of APA’s Div. 21 (Applied Experimental and Engineering Psychology). Human factors psychologist Arathi Sethumadhavan, PhD, has found almost limitless opportunities in the health-care field since finishing her graduate degree in 2009. Though her background was in aviation, she found her human factors skills transferred easily to the medical sector—and those skills have been in demand. 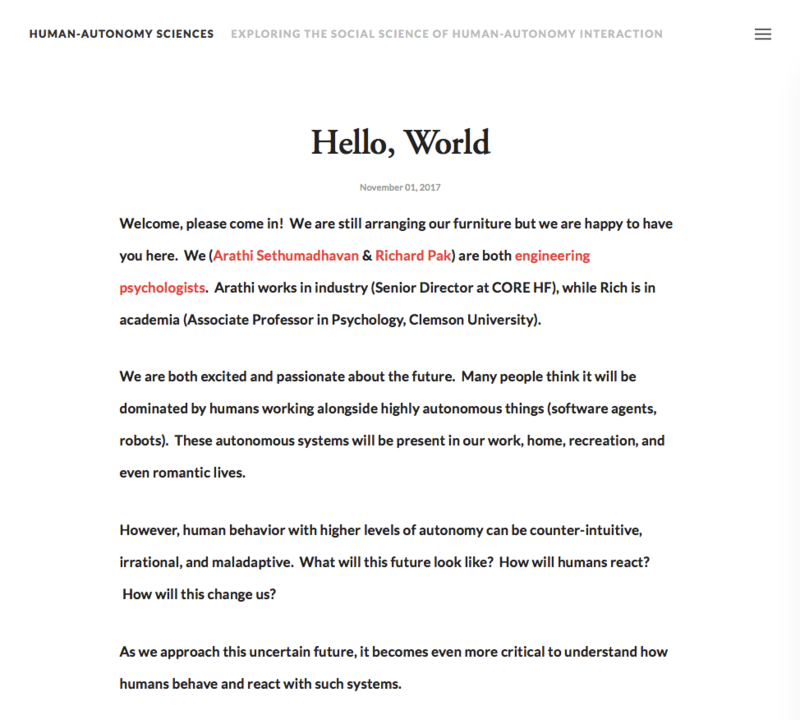 Arathi and I have recently started a new blog, Human-Autonomy Sciences, devoted to the psychology of human-autonomy interaction. We hope you visit it and contribute to the discussion! Previous PostDesigning the technology of ‘Blade Runner 2049’Next PostDid a User Interface Kill 10 Navy Sailors?